Type I: <25 years old, Reversible, Swelling, Tendonitis, No Tears, Conservative Treatment. Pain is usually reported during ADL and especially during the night. loss of mobility is associated with this stage. Type II is more advanced and tends to occur in patients between 25 to 40 years of age. The pathological changes show fibrosis as well as irreversible tendon changes. While Neers Classification of SIS was key to understanding shoulder pathology at the time, SIS was further broken down into four subtypes associated with either External Impingement (Primary or Secondary) and Internal Impingement. Primary External Impingement related to structural changes, either congenital or acquired, that mechanically narrow the subacromial space such as; bony narrowing or osteophyte formation, bony malposition after a fracture, or an increase in the volume of the subacromial soft tissues. The shape of the acromion process of the scapula or shoulder blade may play an important role in recovery and treatment from primary impingement. Secondary External Impingement related to abnormal scapulothoracic kinematics, strength balance alteration resulting in functional disturbance in the centering of the humeral head, leading to an abnormal displacement of the center of rotation when the arm is elevated. Generally caused by weakness of the Rotator Cuff Muscles (functional instability) combined with a glenohumeral joint capsule and ligaments that are to loose (micro-instability). Impingement generally occurs at the coracoacromial space secondary to anterior translation of the humeral head as opposed to the Subacromial space that is seen in primary impingement. Typically occurs in younger individuals with pain is located in the anterior or anterolateral aspect of the shoulder. The symptoms are usually activity specific and involve overhand activities. Internal Glenoid Impingement is probably the most common cause of posterior shoulder painin the throwing or overhead athlete. Caused by impingement of the articular surface (intra-articular) of the Rotator Cuff (posterior edge of the supraspinatus and the anterior edge of the infraspinatus) against the posterior-superior-glenoid and glenoid labrum. Mainly seen with repetitive overhead activities, this positioning becomes pathologic during excessive external rotation, anterior capsular instability, scapular muscle imbalances, and/or upon repetitive overload of the rotator cuff musculature  .These deficiencies result in poor scapulohumral control. 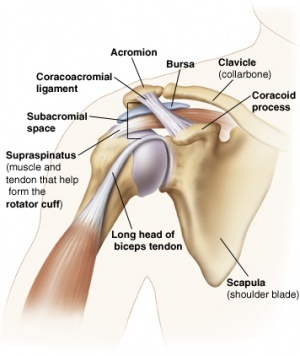 These definitions and descriptions of SIS are based on a hypothesis that acromial irritation leads to external abrasion of the bursa, rotator cuff or other structures within the subacromial space. Throughout the years, the description progressed from SIS to ‘impingement related shoulder pain’, with the growing opinion that ‘impingement’ represents a cluster of symptoms and a possible mechanism for the pain, rather than a pathoanatomic diagnose itself. This remained the dominant theory for injury to structures within the subacromial space for the past 40 years, and has been the rationale to guide clinical tests, conservative treatment, surgical procedures and rehabilitation protocols, however the validity of this model of acromial impingement has been challenged from both a theoretical and practical perspective throughout the last decade, with suggestions that the use of SIS terminology can potentially contribute to negative expectations of physiotherapy and conservative treatment for patients, which may compromise outcome, often resulting in an increased incidence for surgery. While controversy surrounding the diagnostic labelling continues to exist, with many different terms in use to describe subacromial pain and it’s pathology in the literature it has been suggested that the label of SIS does not fully explain the mechanism. Many other diagnostic labels have been proposed but it has been suggested that the term Subacromial Pain Syndrome (SAPS) best describes the pain thought to originate from structures lying between the acromion and the humeral head, most often associated with some degree of shoulder dysfunction, but does not reflect many other causes of shoulder pain located outside the subacromial space. SAPS is the most common disorder of the shoulder, accounting for anywhere between 44% to 65% of all complaints of shoulder pain,  with the incidence increasing with age. Peak incidence occurs during the sixth decade of life. The affected patients are generally over age 40 and suffer from persistent pain without any known preceding trauma. 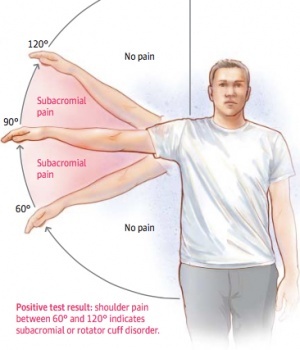 Patients report pain on elevating the arm between 70 ° and 120 °, the “Painful Arc” (Figure 3), on forced movement above the head, and when lying on the affected side. The symptoms may be acute or chronic. Most often it is a gradual, degenerative condition that causes "impingement", rather than due to a strong external force. Therefore, patients often have difficulties with determining the exact onset of symptoms. Antero-posterior View with the arm at 30 degrees external rotation which is useful for assessing the glenohumeral joint, subacromial osteophytes and sclerosis of the greater tuberosity. Outlet Y View is useful because it shows the subacromial space and can differentiate the acromial processes. Axillary View is helpful in visualizing the acromion and the processus coracoideus, as well as coracoacromial ligament calcifications. The size of the subacromial space can also be measured. MRI can show full or partial tears in the tendons of the rotator cuff, and inflammation to weak structures. Ultrasound and arthrography are being used when rotator cuff tears are suspected or in complex cases. Ultrasound of the shoulder is a sensitive and specific method. The diagnostic accuracy is good and comparable to that of conventional MRI for identification and quantification of complete (full-thickness) rotator cuff injuries. The sensitivity and specificity of ultrasound and conventional MRI are not significantly different in the detection of partial- or full-thickness rotator cuff tears with MR Arthrography an accurate method to rule out partial rotator cuff injuries. Conservative treatment consists of; relative rest, reduction of aggravating activities, in particular overhead activities, NSAID’s to reduce pain and swelling, physical therapy management, and subacromial injection. Cortisone is often used because of its anti-inflammatory and pain reducing effect, but this is controversial depending on the structure involved and should not be utilised in tendon related pain. There is no convincing evidence that surgical treatment is more effective than conservative treatment and surgery should only be considered when the conservative treatments fail to reduce the pain or restore function. Several surgical techniques are available, depending on the character and severity of the injury but no clear preference for surgical technique can be indicated currently. Bursectomy or removal of the subacromial bursa. Acromioplasty to increase the subacromial space by removing a part of the acromion. Arthroscopic acromioplasty is less invasive and requires lesser rehabilitation than the open (Neer) acromioplasty. No difference in outcome (shoulder function, complications) has currently been shown between an arthroscopic approach and an open approach, with a bursectomy likely to give the same clinical outcome as a bursectomy with acromioplasty. Lower and Middle Trapezius strengthening such as; Eated press up,Unilateral scapular rotation, Bilateral shoulder external rotation, Unilateral shoulder depression. The motions of the rotator cuff that are emphasized for strengthening are internal rotation, external rotation and abduction. It is important to remember that the function of the rotator cuff, in addition to generating torque, is to stabilize the glenohumeral joint. Thus, stronger rotator cuff muscles result in better glenohumeral joint stabilization and less impingement. A typical initial exercise program involves the use of 4 to 8 weights, with 10 to 40 repetitions performed three to five times a week. ↑ 1.0 1.1 de Witte PB Nagels J van Arkel ER, et al. Study protocol subacromial impingement syndrome: the identification of pathophysiologic mechanisms (SISTIM). BMC Musculoskelet Disord. 2011; 12:1-12. ↑ 2.0 2.1 2.2 Cools AM, Michener LA. Shoulder Pain: Can One Label Satisfy Everyone and Everything? Br J Sports Med. 2017 Feb 16;51(5):416–7. ↑ 3.0 3.1 3.2 3.3 Lewis J. Subacromial Impingement Syndrome: A Musculoskeletal Condition or a Clinical Illusion? Physical Therapy Reviews 2011;16:388-298. ↑ Neer CS. Anterior acromioplasty for the chronic impingement syndrome in the shoulder: A preliminary report. J Bone Joint Surg Am. 1972;54:41–50. ↑ 8.0 8.1 8.2 8.3 Bigliani LU, Levine WN. Current concepts review: Subacromial impingement syndrome. J Bone Joint Surg Am. 1997;79:1854–1868. ↑ 9.0 9.1 9.2 Harryman DT, Sidles JA, Clark JM, McQuade KJ, Gibb TD, Matsen FA. Translation of the humeral head on the glenoid with passive glenohumeral motion. J Bone Joint Surg Am. 1990;72-a:1334–1343. ↑ 11.0 11.1 Nicholson GP, Goodman DA, Flatow EL, Bigliani LU. The acromion: Morphologic condition and age-related changes. A study of 420 scapulas. J Shoulder Elbow Surg. 1996;5:1–11. ↑ Lewis JS, Wright C, Green A. Subacromial impingement syndrome: The effect of changing posture on shoulder range of movement. J Orthop Sports Phys Ther. 2005;35:72–87. ↑ 16.0 16.1 16.2 Urwin M, Symmons D, Allison T, et al. : Estimating the burden of musculoskeletal disorders in the community: the comparative prevalence of symptoms at different anatomical sites, and the relation to social deprivation. Ann Rheum Dis 1998; 57: 649–55. ↑ 17.0 17.1 McClure PW, Michener LA, Karduna AR. Shoulder function and 3-dimensional scapular kinematics in people with and without shoulder impingement syndrome. Phys Ther. 2006;86:1075–1090. ↑ 18.0 18.1 Belling Sorensen AK, Jorgensen U. Secondary impingement in the shoulder. Scand J Med Sci Sports. 2000;10:266–278. ↑ 19.0 19.1 19.2 Lukasiewicz AC, McClure P, Michener L, Pratt N, Sennett B. Comparison of 3-dimensional scapular position and orientation between subjects with and without shoulder impingement. J Orthop Sports Phys Ther. 1999;29:574–583. ↑ 20.0 20.1 20.2 Belling Sorensen AK, Jorgensen U. Secondary impingement in the shoulder. Scand J Med Sci Sports. 2000;10:266–278. ↑ 21.0 21.1 Cuff A, Littlewood C. Subacromial Impingement Syndrome - What does this mean to and for the Patient? A Qualitative Study. Musculoskeletal Science and Practice. Elsevier Ltd; 2017 Oct 17;:1–14. ↑ 22.0 22.1 22.2 22.3 22.4 22.5 22.6 22.7 22.8 22.9 Diercks R, Bron C, Dorrestijn O, Meskers C, Naber R, de Ruiter T, et al. Guideline for Diagnosis and Treatment of Subacromial Pain Syndrome. Acta Orthopaedica. 2014 May 21;85(3):314–22. ↑ 23.0 23.1 23.2 Björnsson Hallgren H. Treatment of Subacromial Pain and Rotator Cuff Tears [dissertation]. Linköping University Sweden. 2012. ↑ Bhattacharyya R, Edwards K, Wallace AW. Does arthroscopic sub-acromial decompression really work for sub-acromial impingement syndrome: a cohort study. BMC Musculoskelet Disord. 2014;15:1. ↑ Ostor AJ, Richards CA, Prevost AT, Speed CA, Hazleman BL: Diagnosis and relation to general health of shoulder disorders presenting to primary care. Rheumatology (Oxford) 2005; 44: 800–5. ↑ Hegedus EJ, Goode A, Campbell S, Morin A, Tamaddoni M, Moorman CT, Cook C. Physical Examination Tests of the Shoulder: A Systematic Review with Meta-analysis of Individual Tests. British Journal of Sports Medicine. 2007 Aug 24. ↑ Hughes PC, Taylor NF, Green RA. Most Clinical Tests Cannot Accurately Diagnose Rotator Cuff Pathology: A Systematic Review . Aust J Physiother. 2008;54(3):159–70. ↑ Murrell GA, Walton JR. Diagnosis of Rotator Cuff Tears. The Lancet. 2001 Mar 10;357(9258):769-70. ↑ Park HB, Yokota A, Gill HS, El Rassi G, McFarland EG. Diagnostic Accuracy of Clinical Tests for the Different Degrees of Subacromial Impingement Syndrome. JBJS. 2005 Jul 1;87(7):1446-55.